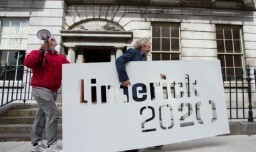 Twenty copies of Limerick’s bid document for the prized European Capital of Culture 2020 designation have been submitted to the Department of Arts Heritage and the Gaeltacht. Dublin, Galway and the Three Sisters or South East regional clustering of Waterford, Wexford and Kilkenny are all bidding for the title, which is regulated by the EU Commission and is to be awarded jointly to an Irish and Croatian city in 2020. Social and physical regeneration – utilising culture – in a European context, is a major theme of the bid document, and City of Culture and the Regeneration process in Limerick has informed the pitch. Limerick is currently the rank outsider to win the EU designation with online bookmaker Paddy Power at 5/1. Galway is the clear favourite at 13/8, followed by the Three Sisters at 2/1 and Dublin at 9/4.